I am both amazed and saddened that Hollywood has become the new Multi-Cultural place of Worship in America. The lines are long to gain entrance into dark theaters, to see darker scenes, created by darkened hearts; that are so real in 3D that you feel like you are there living out the story. The story lines are filled with alien beings, demons, monsters, horrors, zombies, witchcraft and bits and pieces of the religions of man swirling in the communion pot that everyone drinks from. Of course these story lines are not hopeless because the Super Hero’s always save the day. People enjoy going to see these tragedies at a distance, where they can take part, but not really be part of what is happening. People think it’s all made up and will never happen; and if it does happen it won’t happen to them. People worry that our Earth is dying. The answer is yes, just like you and I will inevitably die. However, death for each of us is only a new beginning of ETERNAL existence in one of two places. The same holds true for the Earth. GOD is going to destroy the earth that groans in SIN and make it NEW Again as He did in the beginning…. Forever. People left behind on the planet during the last 3 years of the Tribulation, when HELL comes to Earth and Hollywood’s Worship Services come to life before their eyes; will still find Super Hero’s available to help them find Salvation. GOD has prepared 144,000 JEWISH SUPER HEROES to save them; if they have eyes to see and ears to hear? There also will be an Angel from Heaven giving them instructions from the sky. And there will be two very OLD Jewish Men (Moses & Elijah) speaking on behalf of God to them and the entire world. CNN will be watched 24/7 during the last 3 years of the end times and people will find that they are experiencing life in 3D, but not in a dark theater. Hollywood’s screenwriters, write half-truths to fill the eyes, minds and hearts of people with darkness and not light. Listen to the words of another screenwriter, from 2,000 years ago. The screenwriter is the Apostle John, to whom the real future was revealed. The words are not from John, but from GOD Himself to all that have ears to hear. 3 And I will grant authority to my two witnesses, and they will prophesy for 1,260 days, clothed in sackcloth. 5 And if anyone would harm them, fire pours from their mouth and consumes their enemies. 6 They have the power to shut the sky, that no rain may fall during the days of their prophesying, and they have power over the waters to turn them into blood and to strike the earth with every kind of plague, as often as they desire. 7 And when they have finished their testimony, the beast that rises from the bottomless pit will make war on them and conquer them and kill them, 8 and their dead bodies will lie in the street of the great city (Jerusalem) where their Lord was crucified. 11 But after the three and a half days a breath of life from God entered them, and they stood up on their feet, and great fear fell on those who saw them. 12 Then they heard a loud voice from heaven saying to them “Come up here!” And they went up to heaven in a cloud, and their enemies watched them. Then I saw another angel ascending from the rising of the sun, with the seal of the living God, and he called with a loud voice to the four angels who had been given power to harm earth and sea, 3 saying, “Do not harm the earth or the sea or the trees, until we have sealed the servants of our God on their foreheads.” 4 And I heard the number of the sealed, 144,000, sealed from every tribe of the sons of Israel: 12,000 men from each of the 12 tribes of Israel. My Passion is the same as HIS PASSION, which is for people to understand reality and what is coming upon the Earth very soon. ISRAEL exists as a declaration to the world that in the records of her history, we find our roots & in the predictions of her prophets we find our future. The LORD did not call you to follow Him to heaven…that will come later. HE Calls you today to follow HIM to WAR… for the hearts and minds of those you love…your wife, husband, son, daughter, grandchildren, brother, sister, aunt, uncle, cousin and friends. Loved ones who will be Left Behind for Eternity WILL become the FORGOTTEN. The story lines are filled with alien beings, demons, monsters, horrors, zombies, witchcraft and bits and pieces of the religions of man swirling in the communion pot that everyone drinks from. Of course these storylines are not hopeless because the Super Hero’s always save the day. Hollywood’s screenwriters, write half-truths to fill the eyes, minds and hearts of people with darkness and not light.Listen to the words of another screenwriter, from 2,000 years ago. The screenwriter is the Apostle John, to whom the real future was revealed. The words are not from John, but from GOD Himself to all that have ears to hear. 3 And I will grant authority to my two witnesses, and they will prophesy for 1,260 days, clothed in sackcloth. 5 And if anyone would harm them, fire pours from their mouth and consumes their enemies. 6 They have the power to shut the sky, that no rain may fall during the days of their prophesying, and they have power over the waters to turn them into blood and to strike the earth with every kind of plague, as often as they desire. 7 And when they have finished their testimony, the beast that rises from the bottomless pit will make war on them and conquer them and kill them, 8 and their dead bodies will lie in the street of the great city (Jerusalem) where their Lord was crucified. 11 But after the three and a half days a breath of life from God entered them, and they stood up on their feet, and great fear fell on those who saw them. 12 Then they heard a loud voice from heaven saying to them “Come up here!” And they went up to heaven in a cloud, and their enemies watched them. My Passion is the same as HIS PASSION, which is for people to understand reality and what is coming upon the Earth very soon. ISRAEL exists as a declaration to the world that in the records of her history, we find our roots & in the predictions of her prophets we find our future. Since the first bite from the fruit of the Tree of Life in the Garden of Eden, this world was given to Lucifer. The GOOD NEWS back then was Lucifer / Satan would rule and reign over Mankind as their god for only a short time. Then ALMIGHTY GOD would pull back his leash and send Satan, the Fallen Angels and every Fallen Person made of flesh since the Fall of Mankind into Hell for Eternity. A place where Hope, Grace, Mercy, Faith and LOVE, the attributes of the Heart of GOD, will not exist. The light of GOD has slowly diminished over the ages, to the point today where the world lives in utter darkness. Mankind’s heart is no longer made of flesh but of Stone. It feels nothing. Mankind now lives focused on its Mind filled with PRIDE, which is completely delusional and reacts only to the whispers of Fallen Demonic Angels who live around them in a dimension we cannot see, touch or smell. Jeremiah 17:9 “The heart is more deceitful than all else and is desperately sick”. I hear the “FEW” praying for the world to get better, for Christian Revival and for the “MANY” all around them to change their ways, see the Light and turn from the Horrible SINS lived out daily before our eyes. My question for you is why you want to beg GOD to bring peace to this world and continue its path of darkness. There will be NO PEACE until the PRINCE of PEACE sets foot on the Earth Again. The Darkness only grows deeper every day all around you. You can actually Feel it and Taste It and Smell It. The Oceans continue to belch up foam and sewage all around us. The only Revival you will see will be in the second half of the Tribulation when the 144,000 Jew’s anointed by JESUS begin to preach to the world and the 2 Witnesses begin to preach to the world and an Angel from Heaven begins to preach to the world during the short reign of the Anti-Christ / False Messiah of this Fallen World. Multiple Billions will come to Christ at that time. BUT they will pay the price with their earthly lives as they STAND ALONE for JESUS. The Signs are EVERYWHERE around you and around the entire earth. TIME is OVER, the DAWN of ETERNITY is Here, and the words JESUS Roared form HIS CROSS….IT IS FINISHED have now begun. I am selfish, I do not pray for the world, I pray for those I have relationships with and members of my family I LOVE, that do not know the LORD. I pray for them because I have a chance to touch their hearts with the Word of GOD. My prayer is that the GOOD SEEDS I plant in them will take root so when I go up in the RAPTURE, they will remember What I Said to them about their need for a SAVIOR from what is SOON COMING. That they would live through the Tribulation and ACCEPT JESUS as their SAVIOR and LORD because their hearts were touched by one of the 144,000 Jewish Spiritual Warriors. And when this Satanic World System is OVER, I will meet them again in HEAVEN and We WILL WIPE the TEARS From EACH OTHERS EYES as we realize WE NOW have ETERNITY to Spend TOGETHER in HEAVEN. Elect Christian or Messianic Jew…Our Purpose is the SAME in CHRIST ! As an Elect CHRISTIAN, Jesus has given you the same Command that He gave the Nation of Israel in its beginning. “To Be a Witness”. The following story will help you better understand Your Purpose in Christ which is the same for me as a Chosen Messianic Jew. “Yes, I got the message…I’m heading out right away! WAIT don’t hang up! Did you look in the mirror? Yes, the mark, I have it too. Don’t worry I’ll be there in time for the INGATHERING. For years now the Jewish Believers have had their own Messianic Ingathering’s. But now the call has come from the HOLY SPIRIT to meet for the FINAL ingathering. For the end of the age of mankind has begun and TIME will Soon Be NO MORE. Fire has swept away the genealogy of every living Jewish person since the destruction of the Temple by the Romans in 70 AD. NO LONGER did we know which tribe our families came from, yet the call was irresistible and so we each came alone to the meeting place. Like the animals coming together to the Ark that Noah built, we too came forth from out of the Nations of the Earth. Each of us a member of the chosen witnesses from eternity past, each of us a member of one of the 12 tribes of Israel. Together we came from every tribe and every tongue and every nation to meet the Lord in the Desert. We came to meet with the LION of the Tribe of Judah, the KING of kings, the LORD of lords to be taught what we must now do prior to HIS Second Coming. The Signs are all around us, the time is short, His True laborers, as throughout the centuries, will be few. Because of the ongoing events on the Earth and the Signs in the Heavens the fields are again ripe unto Harvest. Jesus has called us to Himself to meet in a desert place where He will teach us as He did the 12 so long ago, to be effective evangelists during the time of Jacob’s trouble. A time of final salvation for those who have ears to hear and eyes that see. Since Pentecost the call to Christians has always been to evangelize effectively. That meant to be able to plant seeds into hearts that will TAKE ROOT. Not to just throw seeds out onto rocky places, or the side of the road or among the thorns. JESUS wants quality seeds placed into the hearts of people. This war was given by God in the end times to the WESTERN world to fight, yet the church has been ineffective as the Apostate Church of the WEST grows larger each day. Just a short distance further over the next rise I can see a halo of light in the distance. I expected millions of people to be there because the light grew in intensity as I approached. Just then my head breached the crest of the hill and I was stunned by what I saw. The children of Israel were lead by the Lord at night by a pillar of fire; so too was a pillar of fire standing before me. 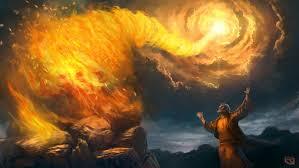 This was Holy Fire that bathed 144,000 Jewish men in white light. This light permeated my soul and then I knew what tribe I belonged to. And I knew where to walk so that I could take my place prepared for me in eternity past, to STAND in the presence of the LIVING LORD. There were peels of thunder and lightning illuminating the valley of decision where we were all gathered waiting for instructions. Then the words came forth from The LORD’S Mouth. They were whispered, yet audible to both the storm and to us…BE STILL and know that I AM God, now hear the WORD of the LORD from my Servant. It grew quiet instantly. Then a ray of light beamed down from Heaven next to Jesus and when the piercing white light dissipated, standing next to Jesus was a small man. The scene reminded me of what happened on the Mount of Transfiguration. Out of that same white light stood Jesus and Moses and Elijah. Moses representing the Law and Elijah representing the Prophets and Jesus representing the WORD of Truth, the FOUNDATION upon which both the Law and the Prophets stood. Yet here there was only one man not two standing next to Jesus. It was the Apostle Paul who stood before us. Paul; the Apostle that Christ built His ONE TRUE CHURCH through. The Church of Christ built with living stones made up of Born Again Jews and Born Again Christians. Then it was Paul who began to address us on the topic of evangelism. His words cut to our hearts and souls. This was no game; this was the war of the ages for the hearts and minds of people. People like the ones that Christ looked down from the Cross-at and said, ”Father forgive them for they know NOT what they do”. Those words apply to every human being that has not come to the realization that they are Sinners in desperate need of a SAVIOR. Paul began recounting his teachings on evangelism by reviewing his journey through the Book of Acts. His was a journey of preaching that continually focused on the un-deniable Historic FACT of the Cross of Christ, and His RESURRECTION. Paul spoke to us about the perversion of the Gospel in the Book of Galatians. He explained to people back then about the soon coming of another gospel, a false gospel that would lure people down the wide road to a false Christ. He spoke of Timothy a young pastor who needed to stay true to what he was taught from the beginning and not water down the Gospel based on the changing whims of generations. Timothy must remain true to the unchanging Doctrines given by Christ at the birth of His Church. The fact that the church did not stay true to the teaching of Christ has caused the apostasy of the Western Church making it ineffective. Paul then ended his course on evangelism by taking us through the Book of Ephesians discussing the ARMOR of GOD. He said that we all must take up the full Armor of God because this war is not physical but spiritual. To wear this armor means NO FEAR of men or demons. It was Paul who stood alone in his time for Christ. And now he stands before us with an indictment of the Church through the ages that is now culminating with the Church of the WEST in our days… at the end of the end times. Then Christ stood and said no longer would the Gospel be left in the hands of believers. Too many believers never grew beyond the milk of MY word. Too many remained within the comforts of fellowship with other Christians rather than going into the world around them, Boldly confronting the darkness. Too many of them spent time learning how to live their Christian life and walk quietly before friends and family, rather than learning how to effectively weald the SWORD of the SPIRIT… in the unseen war all around them. And so as Jesus continued to speak to us HE said the Believers were no longer on the earth. They have been SNATCHED / Raptured up into heaven where they will wait along with the great cloud of witnesses; for the final appointed time of the end of the age of mankind. They have done what they could but it was not good enough! And Jesus looking out amongst the 144,000 Jews said… I turn back to you once again for this final hour of Salvation. Not as a Nation but as MY Chosen Jewish SPIRITUAL WARRIORS of Israel. I gave the task of world reconciliation to your father Abraham through Isaac and to a people numbered greater than the sands of the seashore but they failed. Then I came to my own and they knew me not. And then my Church was born and they failed as well. This task of evangelism I now give to you to complete; so that the circle of life can be closed and finally fulfilled. And a new world without end can be born again. I am giving all of you the task assigned to the 12 Apostles over 2,000 years ago. But I have multiplied your number to 144,000. All of you will be empowered for witness and sealed by the Holy Spirit for protection. You will walk in the darkness of this world and touch the hearts of multitudes on behalf of ME. Hearts will be made NEW and You will not fail. So go forth into the world in the might and power of the HOLY SPIRIT. Have no fear of men or demons. Take the Sword of the Spirit and cut into the hearts of mankind everywhere with the true Gospel and I will give the increase…Until the Nets are Full and the last one who was called to believe from eternity past… finally Will Believe. Of course these storylines are not hopeless because the Super Hero’s always save the day. CNN will be watched 24/7 during the last 3 years of the end times and people will find that they are experiencing life in 3D, but not in a dark theater. Hollywood’s screenwriters, write half-truths to fill the eyes, minds and hearts of people with darkness and not light. 3 And I will grant authority to my two witnesses, and they will prophesy for 1,260 days, clothed in sackcloth. 5 And if anyone would harm them, fire pours from their mouth and consumes their enemies. 6 They have the power to shut the sky, that no rain may fall during the days of their prophesying, and they have power over the waters to turn them into blood and to strike the earth with every kind of plague, as often as they desire. 7 And when they have finished their testimony, the beast that rises from the bottomless pit will make war on them and conquer them and kill them, 8 and their dead bodies will lie in the street of the great city (Jerusalem) where their Lord was crucified. 11 But after the three and a half days a breath of life from God entered them, and they stood up on their feet, and great fear fell on those who saw them. 12 Then they heard a loud voice from heaven saying to them “Come up here!” And they went up to heaven in a cloud, and their enemies watched them.